Midan City, which will be created in the Incheon Free Economic Zone’s Yeongjong district by 2014, aims to become the world’s leading leisure complex. “Midan City will become a monumental landmark of Korea which will provides shopping, entertainment and business facilities,” Lippo Incheon Development Co. CEO Joseph Chiang said at a launch ceremony in Incheon on Wednesday. 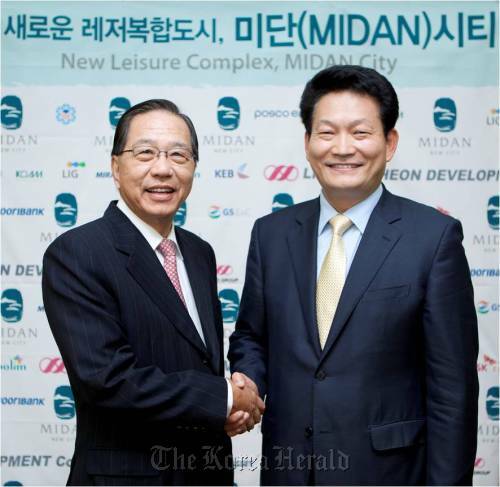 Joseph Chiang (left), CEO of Lippo Incheon Development Co., shakes hands with Incheon Mayor Song Young-gil at the launch ceremony of Midan City in Incheon on Wednesday. Lippo Incheon Development is a consortium of Hong Kong-based Lippo Group and local firms including Incheon Urban Planning Corporation, GS E&C, POSCO E&C and SK E&C. Lippo Group made an unusually large investment of 840 billion won into the project, having seen the potential of Midan City, and is planning to carry out more than 30 percent of the total development. The 1.8 million square meter-leisure town, formerly named Woonbuk Leisure Complex, is a large-scale project which is expected to cost the developer 6 trillion won ($5.2 billion) to complete. The complex will house diverse types of infrastructure such as an international school, international health center, business district, shopping centers and a leisure area. The foundational construction for the project which was launched in 2008 is scheduled to be completed by the end of the year, while the facilities there are expected to be completed by 2014. Meanwhile, Incheon is seeking ways to make Yeongjong district a Visa-free zone, led by Incheon mayor Song Young-gil who is known to have shown large interest in Midan City and brought up the idea recently to President Lee Myung-bak.